I’ve been very casual of late… taking down the tree, shaking everything back into place after the holidays. But, before you start to worry about me letting down the easy and elegant side, consider the elements of a casual wardrobe. Or, as casual wardrobe as I think it should be. 1.) The polo collar sweater. It can function as a “normal” sweater over a shirt and tie, with or without a sportcoat, or stand on its own. The most luxurious would be of cashmere, but merino wool doesn’t lag too far behind in the refined department. I tend toward solid colours, navy (see the photo above,) camel, olive, grey and black are the most frequently pulled from the closet. 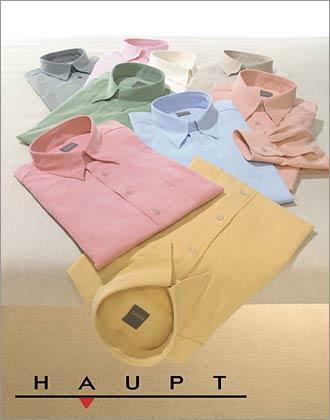 But a nice chartreuse, robin’s egg blue, orange, red will liven up the typical man’s wardrobe palette. When worn as a stand alone layer, I find it useful to have a silk, longsleeve undershirt worn beneath to keep me a bit warmer. An even more casual alternative are the “new” half-zip versions or a shawl collar style. 2.) The v-neck sweater. Not as useful as the polo collar in that I don’t like them worn over a t-shirt only. But they do frame a collar and necktie very nicely. 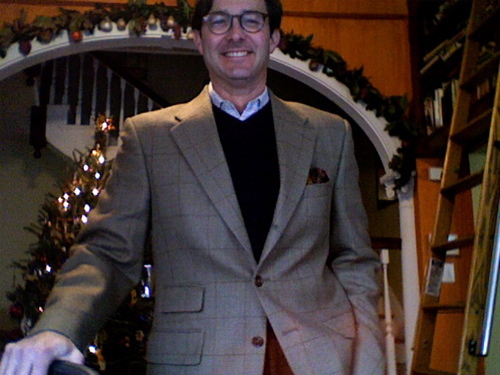 While I have a few sweater vests (better for those in between days,) the long sleeve version is preferable to me as I don’t feel as self-conscious working without a sportcoat. As with a polo collar sweater, I may tuck a silk neckerchief in an open collar shirt as a discreet way to hide my undershirt, if the “v” is deeper. 3.) The cashmere (rollneck) turtleneck sweater. 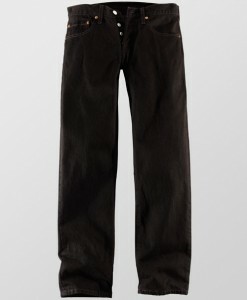 In black or navy it is a fast way to make a pair of corduroys and a tweed jacket look a little more pulled together. 4.) Jeans. Yes, jeans. Straight leg. Dark rinse. No rips. No tears. No “whiskers.” No fraying. Have them drycleaned to maintain them in good order. 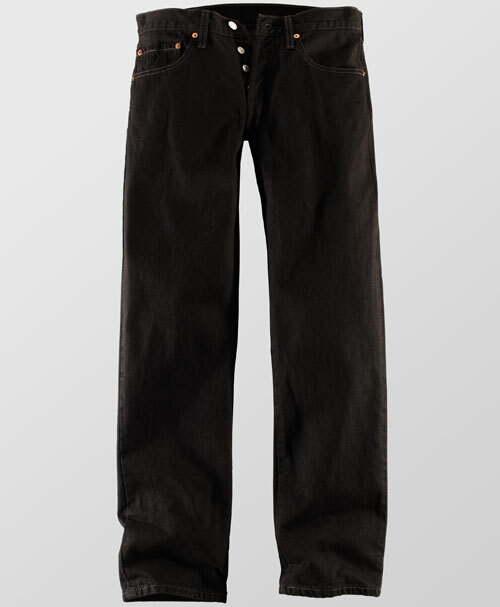 Corduroys (I like at least eight wale wide) and moleskin trousers are so ridiculously comfortable that you may be willing to trade in your denim permanently. But I am starting to believe that there are some occasions where denim is … expected … and appropriate. 5.) Grey Flannels. The workhorse of the winter wardrobe. Choose single pleats or flat fronts (although you will see double pleats become fashionable again by next year.) Yes, you may wear your flat fronts with cuffs (turn-ups) if you like. I prefer Oxford grey or charcoal. They go with everything. These days, in fact, a gentleman dressed in impeccably cut flannels and a blue blazer, accessorized with a crisp white shirt, sober tie and white pocket square will be well-dressed for all but a black tie affair. 6.) 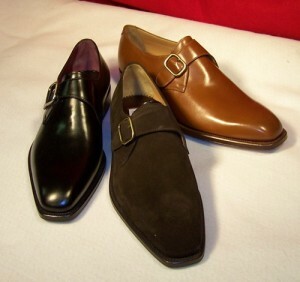 Monkstrap shoes. They fall somewhere between dress and casual and so can be dressed up or down. Add a lug sole and they are more casual, but sturdy enough to survive wintery sidewalks. Good alternatives are pebble grained, lug soled bluchers, a paddock boot and cordovan tassel loafers (no kilties, please.) Suede is always elegant, if a bit impractical in inclement weather. 7.) The sportcoat or blazer. Not always necessary, but always welcome. Tweeds and checks will let you stand elegantly apart while still remaining casually dressed. Wear them with any of the trousers mentioned above. As a side note, I love a double-breasted blue blazer or tweed jacket (I’m not sure you can find one off-the-rack.) Even jeans look more elegant under them. 8.) Hidden buttondown collars. They stand up like their more traditional brethren, but by virtue of being hidden are more easily dressed up when called upon to stand with the double-breasted blazer. Cut-away collars also work well standing alone, but to wear one casually may require an advanced degree in sprezzatura. 9.) Your Coat. This gets tricky. 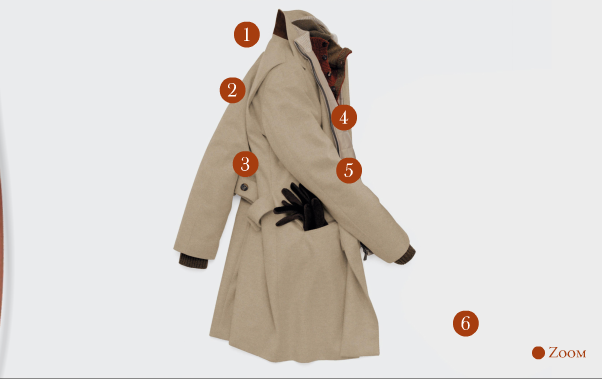 I’m a big fan of wearing a topcoat, see my posts on the camelhair polo coat, but when the weather turns wet as well as cold, a weatherproof coat made of the Stormsystem fabrics from Loro Piana or a Barbour product will be your best friend. As Instructor McGuire says: “There’s no such thing as bad weather; only bad gear.” Look good on your downtime this winter. 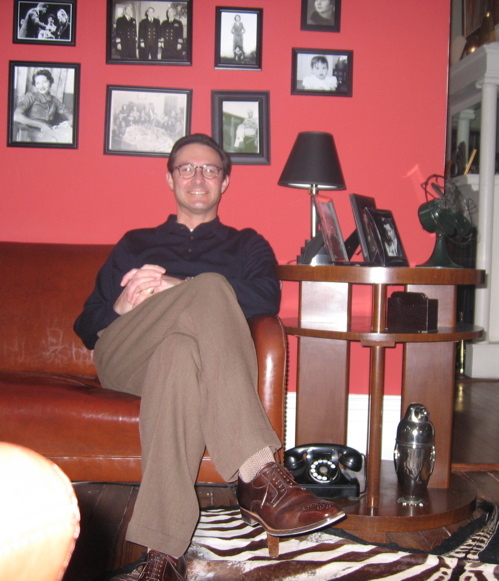 This entry was posted in Elegantology and tagged casual dressing. Bookmark the permalink. at last, i’ve no hair left, and it is from entering your address into my blog-roll over and over without any luck. and i entered the address you were kind enough to send me ,which has not taken. so i have you somewhere else on my side-bar. i am sending your site to my brother in DC , he will enjoy you and your blog. BTW, if that’s your bar, I wish I had more friends like that! With more invitations, naturally–where’s your drink? Ohhh monkstraps – I swoon. All great suggestions. I travel a lot and the polo collar sweater in merino is now one of my staples for the reasons you note. I am ashamed to admit that I only recently bought a dark gray v-neck sweater and I now put it in every suitcase. Another great post! I would have had a drink in my hand in my bar though! Here I go again, request for the female coordinates. Ms. Hostess, I know, I know. I include them only because I have recently seen them elegantly deployed. Mr. Lane and iCG, it was rather early and I was out of tomato juice at any rate. TBD, they are wonderful, aren’t they? Ms. Finberg, thanks for trying. And for reading! Mrs. PvE, I was thinking of that very thing when I was putting this post together. The woman’s equivalent takes me a bit longer as there are many more choices and a steeper learning curve for me. But I’ll get together the list very soon. Equal time! Absolutely. 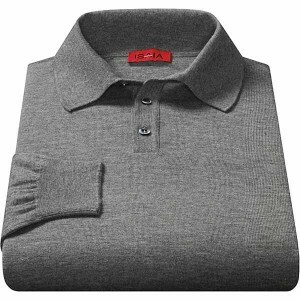 I need to adopt a polo collar sweater or two as I like the look; I’ve just worn through them over the past few years and failed to replace them. I live in v-necks in my “casual” workplace and as you suggest pair them in cooler weather with flannel slacks in various hues of charcoal and heathered blues. I thought Admiral Byrd made the bad gear quip? Thanks for tipping your hat to the Barbour jacket! My husband and I have the same style (the Bedale, I think? ), and we buy the warm fleecy liners for cold weather. I think they are awesome and I think men are very cute in them. Our college son (age 21–what a great time in life!) just chose one for himself with a quilted lining. Our daughter (now 18) started wearing Barbour at about age 12–a navy blue quilted jacket used for riding and also great through the years with her school uniform! If you buy it large enough for kids, they can wear it for many years! If a lady is small enough, she can order a children’s size and save a bundle. #4 do you really think that sending jeans to the dry cleaners is the best option to maintain them in good order? I had always thought it was best to wash them in cold water inside out. like2run, cold washing will work, too. But then you have to worry about them wrinkling. Scott, I’m sure you’re right. It stuck in my head as I was bear crawling on ice one winter. I spotted the writer just the other day with Mrs. E; childless, they were strolling down Carystreet looking like a well heeled, chic Park Avenue couple. He was elaborately wrapped in a silk scarf and could write an entire blog on this forgotten wardrobe necessity; how should a scarf be worn or tied? Can they be bought from street venders? Or must they purchased over the counter at Bergdorph’s?